GILCHRIST – For students in Brian Wachs’ class, the start of the school year is an adventure. On the second day, students in his woods and metals shop class hike out behind the school. Their mission? Fell a tree using only hand tools, geometry and math. “It’s a lot of fun because we get to go out on all these adventures,” said Katie McDaniel, 15, who has been taking Wachs’ classes since seventh grade. “It’s not step one, step two. 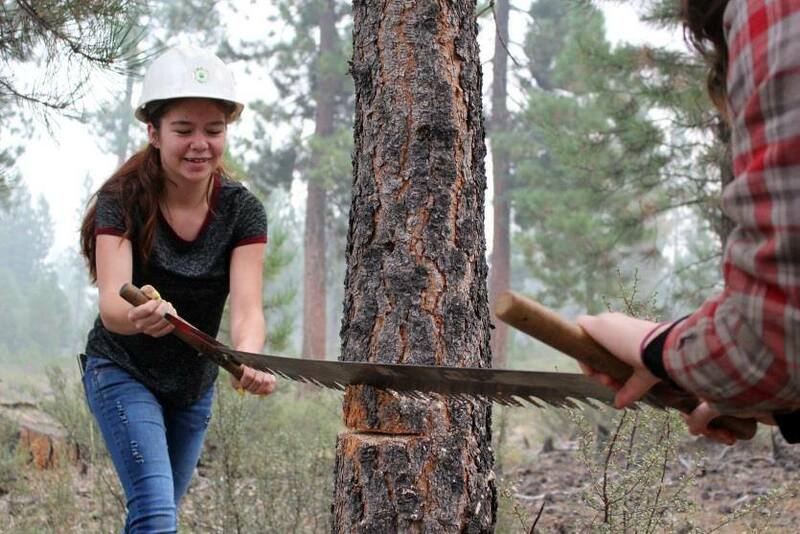 On Wednesday, Sept. 6, the Gilchrist students took a two-handed bucksaw to a tree Wachs’ had picked out. They decided which direction they wanted the tree to fall, then began sawing angled cuts into the tree’s trunk to cause it to fall in that specific direction. Katie said getting out and sawing into a tree was very different from reading about the logging industry in a book. 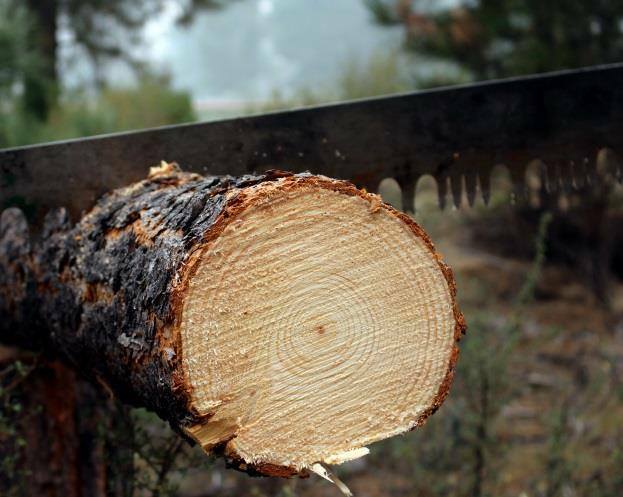 The town of Gilchrist has a strong history with the timber industry, logging and forestry. Gilchrist was one of the last company towns in Oregon, according to the Oregon Encyclopedia. In 1937 the Gilchrist Timber Company built and founded the town to house a mill, workers’ housing and amenities. Pacific still runs a mill in town, it employs far fewer people than the Gilchrist mill did in its heyday. It even connects the students to history in the tools they use. Wachs’ doesn’t know how old the two-person bucksaw the class uses is, but admits it bears a strong resemblance to antiques on the walls of some homes. Wachs’ and his students didn’t just fell a tree for the fun of doing it. They will use the wood to make projects. 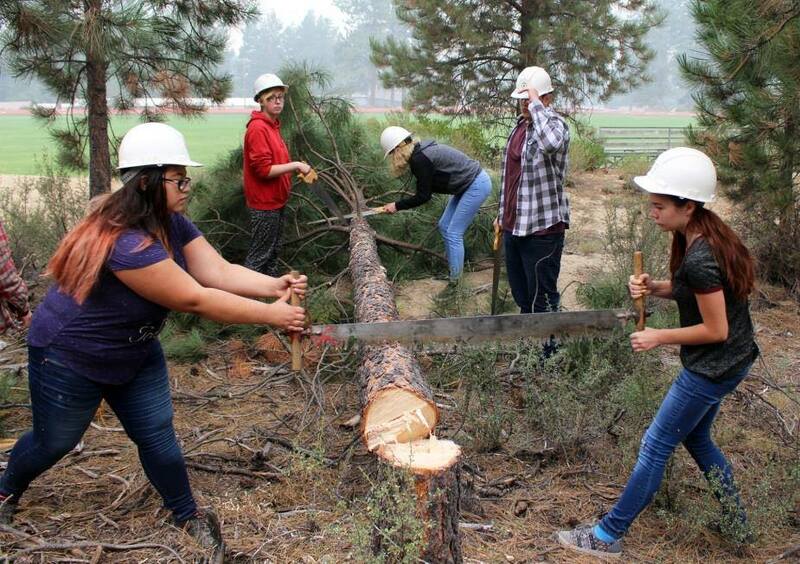 On Wednesday, the students made the exact cuts to send the tree falling precisely where they planned. Next, they brought out the hand saws and continued cutting the trunk into shorter lengths. Later in the week they brought those lengths into the school shop. Through the semester they will plank them and build picture frames. “They come into my class and they know they are going to get sweaty, they’re going to get dirty,” Wachs said.